Units 1-2 Review 8000 BCE—600 CE. 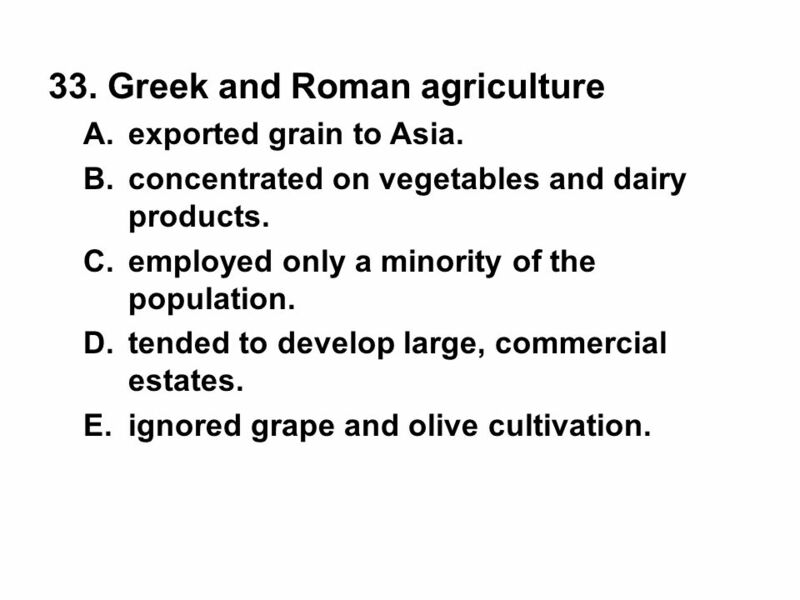 the period at which agriculture was developed. the period in which simple stone tools were developed. 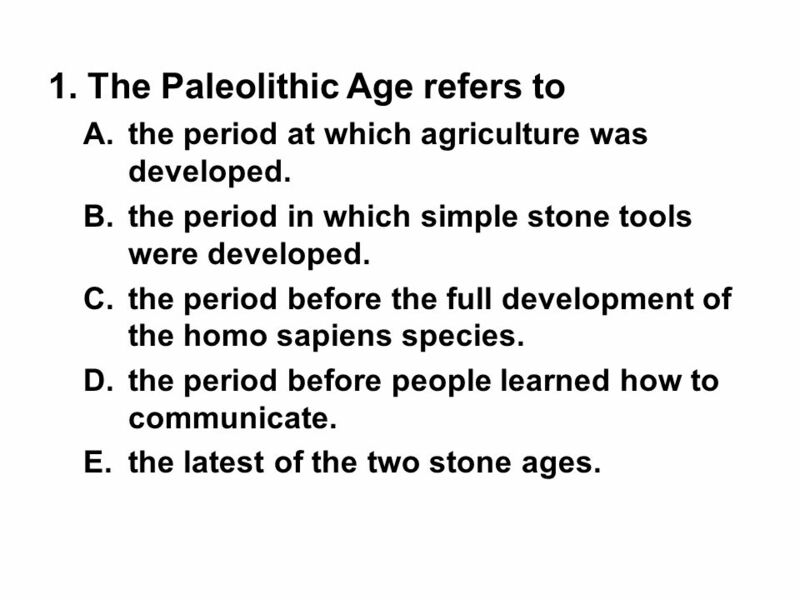 the period before the full development of the homo sapiens species. the period before people learned how to communicate. the latest of the two stone ages. the ability to spread to various geographic settings and climate zones. the ability to organize large political units. the inability to communicate about abstractions such as death. that all tasks were shared equally by men and women. land ownership was equal. Egypt. the Middle East. Central America. China. India. it practices sedentary agriculture. it involves tool use. it has religious rituals. it has some political structure. it gathers food to survive. resulted from new technologies, notably the invention of paper. 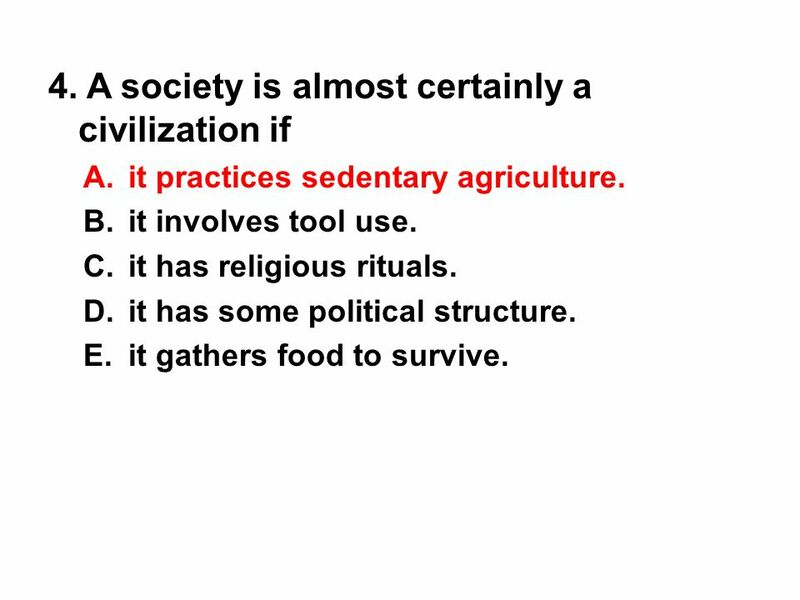 helps explain why agriculture could develop. helps explain why governments could become more formal and bureaucratic. 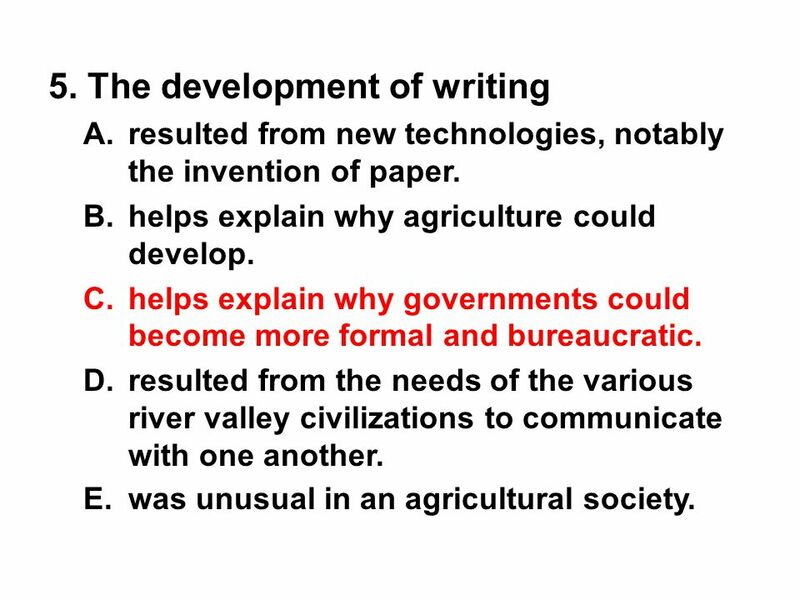 resulted from the needs of the various river valley civilizations to communicate with one another. was unusual in an agricultural society. well-organized, durable empires. extensive trade. firm religious beliefs. greater social equality. more modest building projects. 17 8. Why did the original inhabitants of Australia not develop agriculture? Australian soil was too barren to grow crops. The Australian climate was too severe. They were too isolated to learn of developments elsewhere until recently. Australia never experienced an ice age. 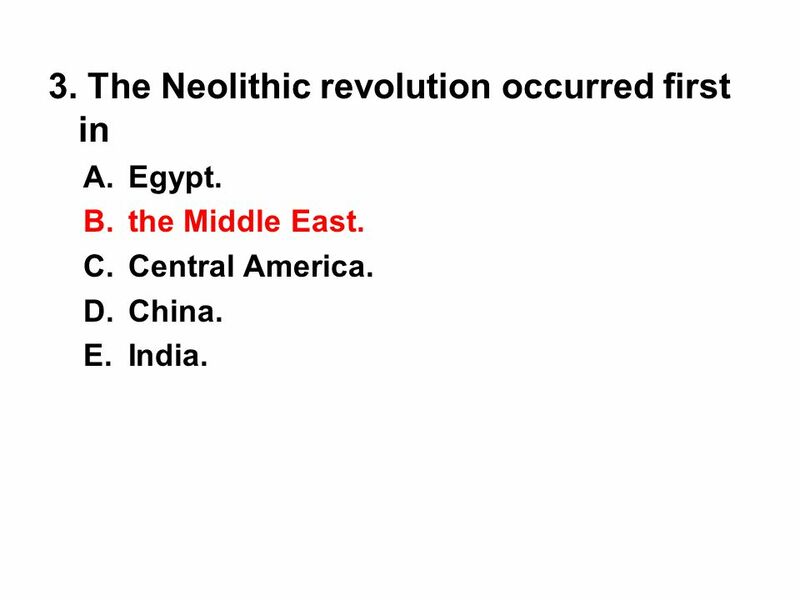 They were prevented from doing so by the Neolithic revolution. 18 8. 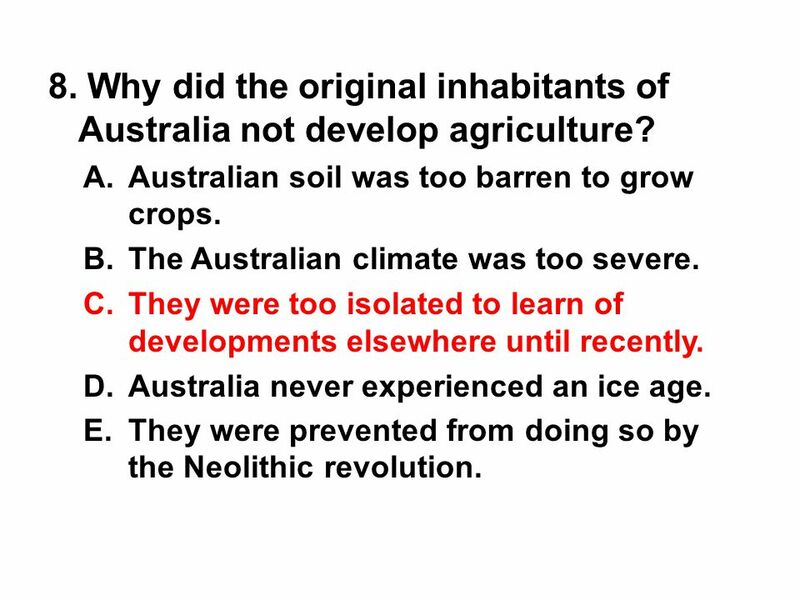 Why did the original inhabitants of Australia not develop agriculture? any emperor who lasted more than two decades. a family that passed the imperial title from generation to generation. powerful bureaucrats who ran the state. big business families who monopolized overseas trade. kings dominated by foreign interests. loyalty to the emperor. centralization of power in the state. 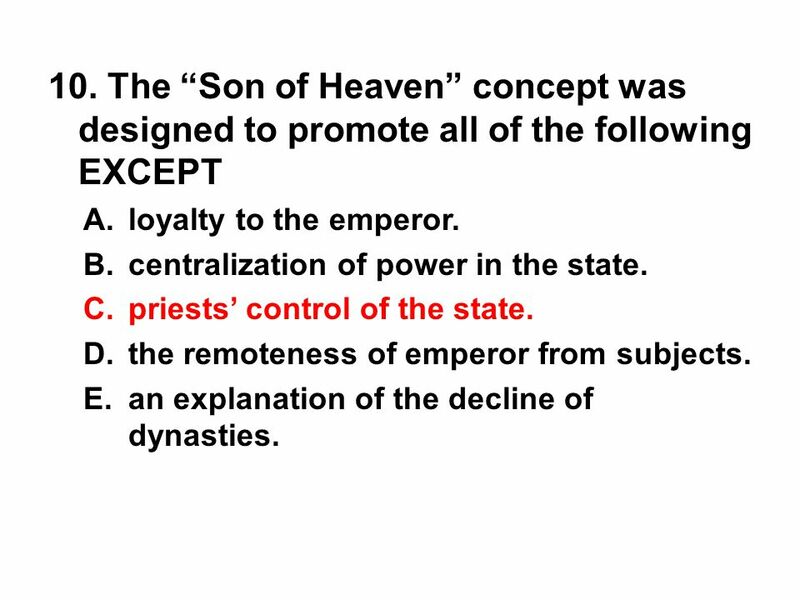 priests’ control of the state. the remoteness of emperor from subjects. 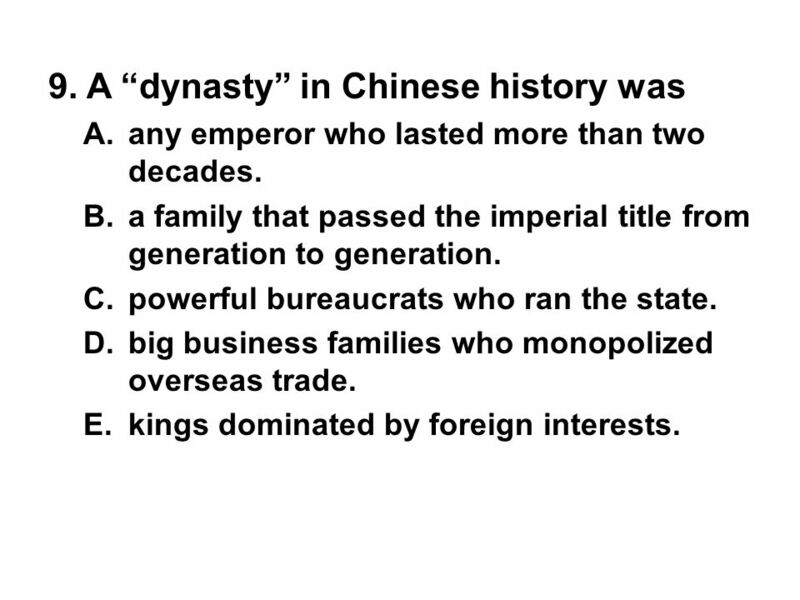 an explanation of the decline of dynasties. it lasted longer. 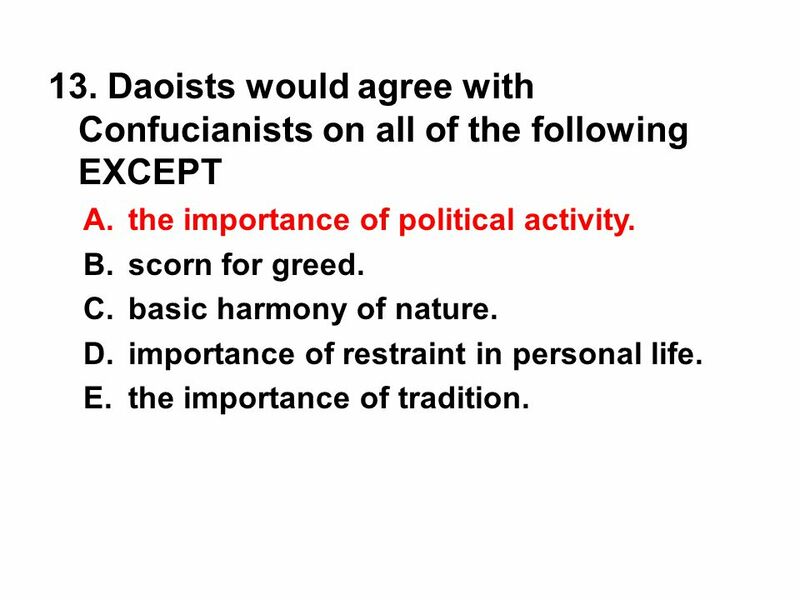 it practiced Confucianism. it was more centralized. 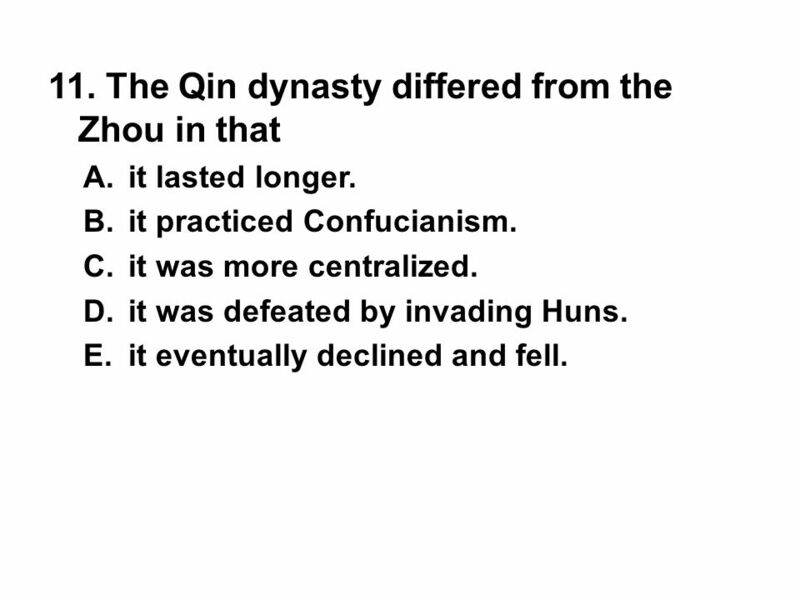 it was defeated by invading Huns. it eventually declined and fell. 25 12. Which of the following was a Confucian belief? Change should be encouraged and modeled by the emperor. A good society has a hierarchy both in family and state. Merchants must be valued for their money-making skills. Governments must not interfere with individual rights. People of all social classes and abilities should be actively involved in government. 26 12. 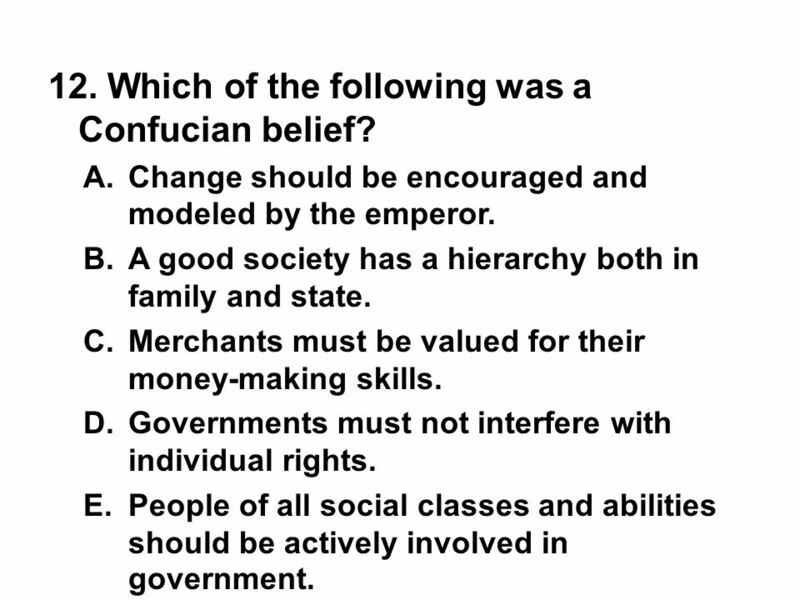 Which of the following was a Confucian belief? the importance of political activity. scorn for greed. basic harmony of nature. importance of restraint in personal life. the importance of tradition. could rise to the level of the emperor but only if they had no children. sometimes become quite powerful in a household. tended to be poor and were sometimes sold into slavery. tended to marry much younger men. would not have children until much older. the spread of paper-making technology from the Middle East. the use of the iron plow from Rome. 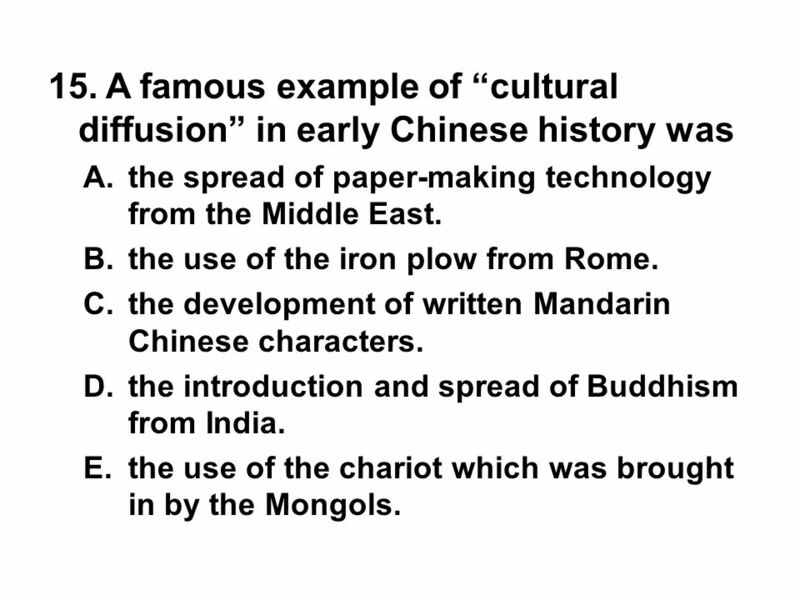 the development of written Mandarin Chinese characters. the introduction and spread of Buddhism from India. the use of the chariot which was brought in by the Mongols. 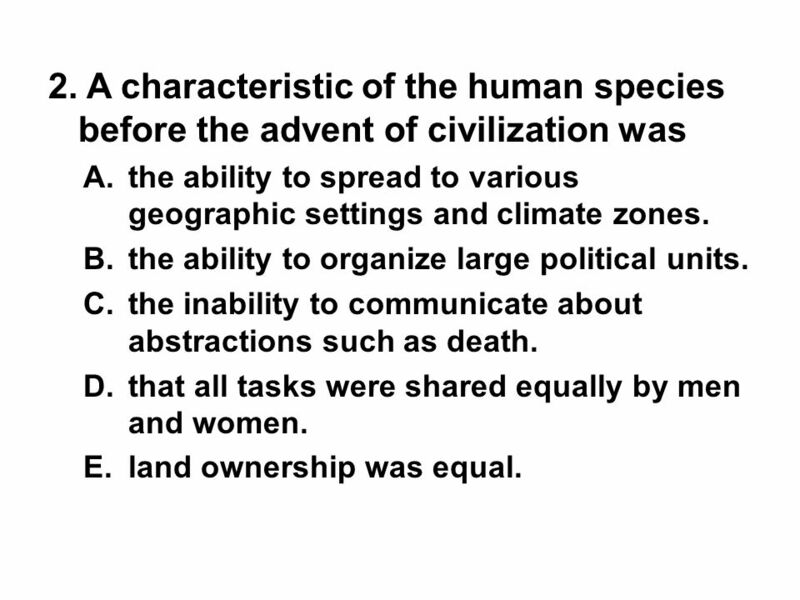 its first civilization. distinctive religious ideas. admiration for India’s earlier inhabitants. new agricultural techniques. political democracy. enforcing rules about social behavior. unifying the subcontinent under a single government. creating widespread interest in constitutional issues. promoting a belief in individual rights. causing unrest and rebellion. 39 19. Hinduism urged that withdrawal from the world was the only path to holiness. Brahmins would automatically gain nirvana after death. all living creatures participated in the divine essence. worship of nature’s spirits and images was blasphemous. monotheism was superior to polytheism. 40 19. 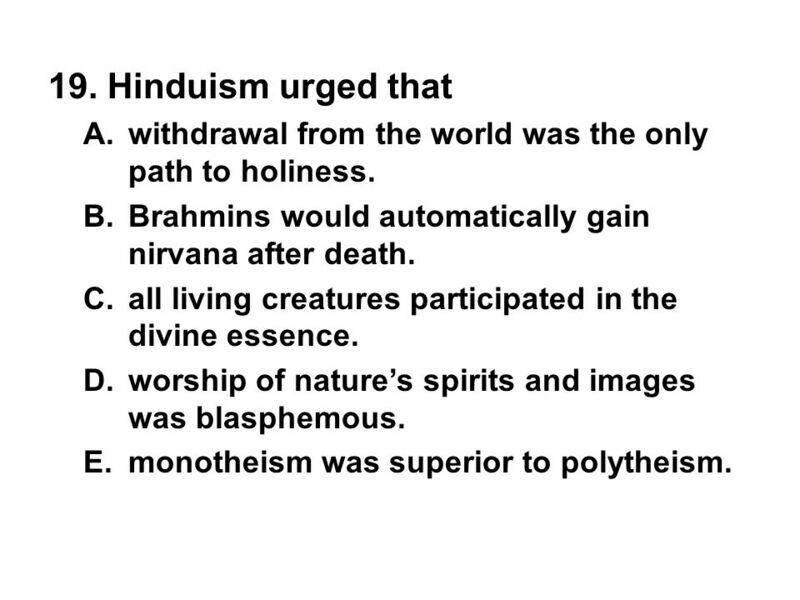 Hinduism urged that withdrawal from the world was the only path to holiness. 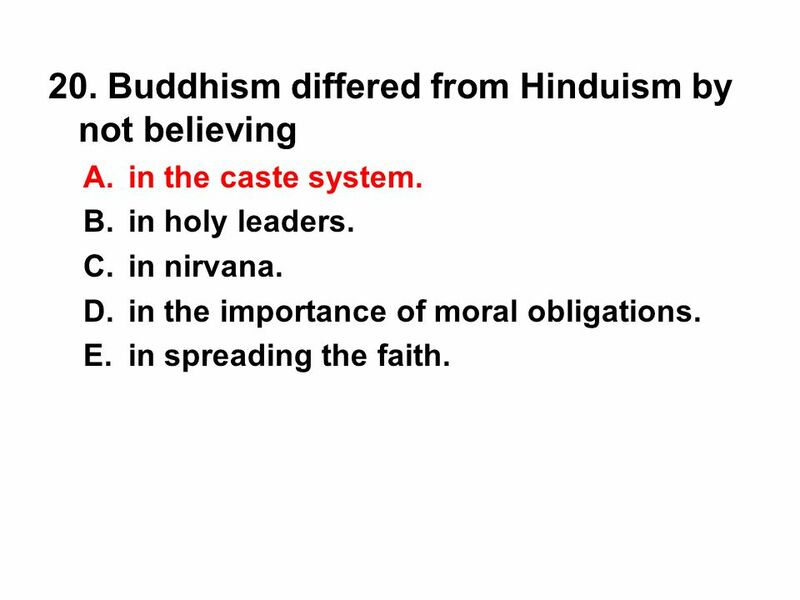 Brahmins would automatically gain nirvana after death. all living creatures participated in the divine essence. worship of nature’s spirits and images was blasphemous. 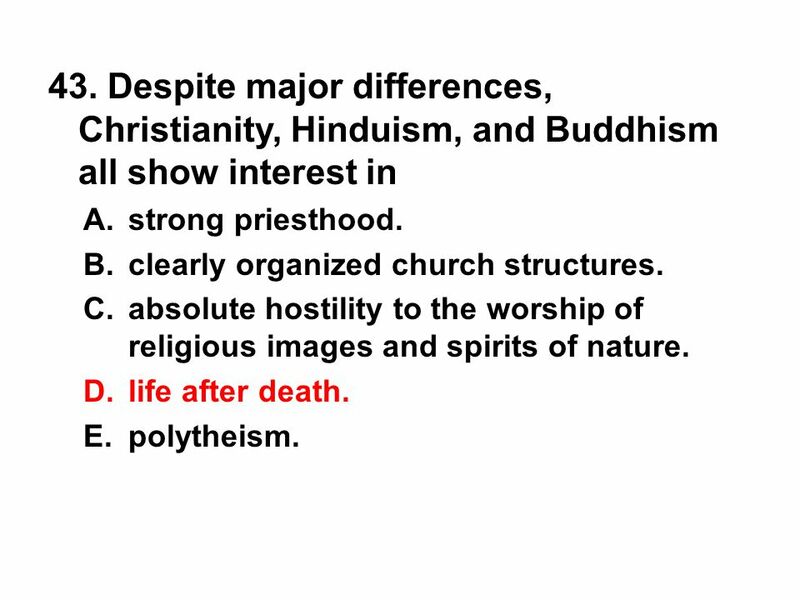 monotheism was superior to polytheism. in the caste system. in holy leaders. in nirvana. in the importance of moral obligations. in spreading the faith. 43 21. “Nirvana” meant full union with the divine essence. reincarnation in a higher caste after a good life. the Hindu holy book. 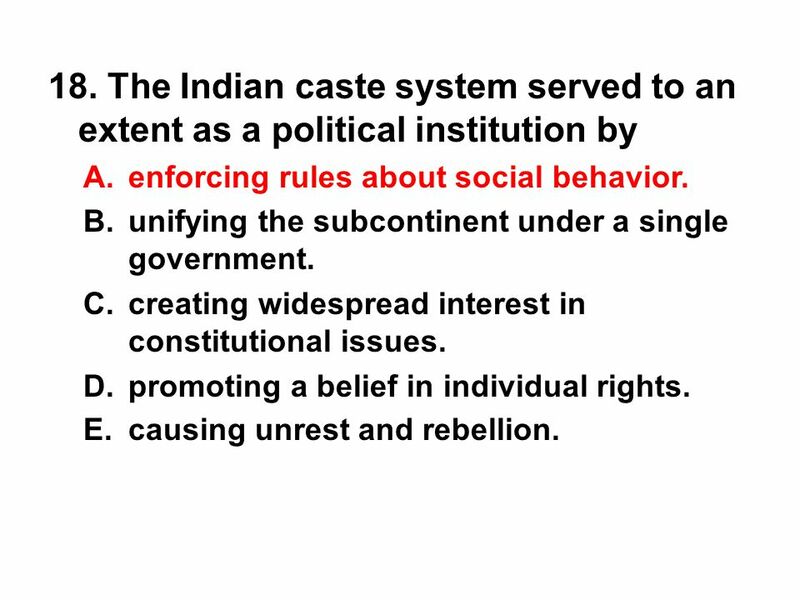 obedience to the rules of the caste system. acquiring earthly wealth. 44 21. 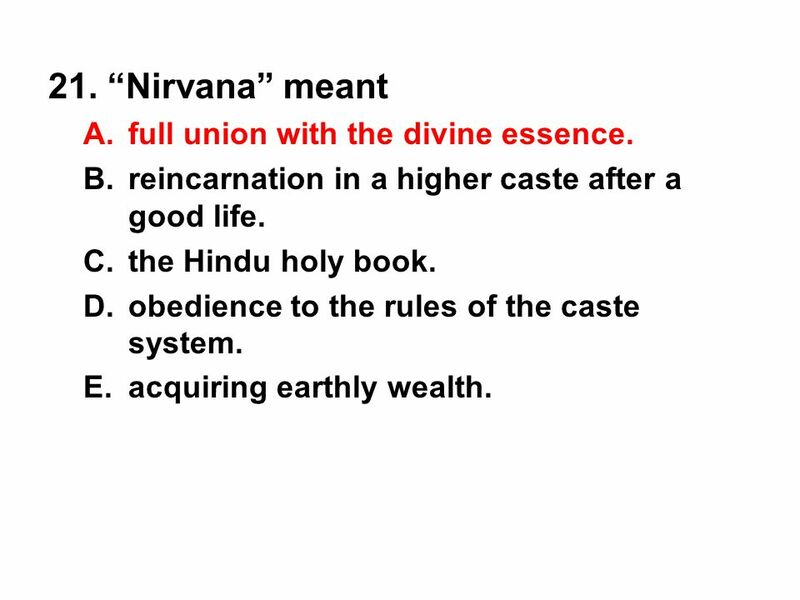 “Nirvana” meant full union with the divine essence. being the first capital of the Gupta Empire. its university that attracted students from all over Asia. being the site where Buddha became enlightened. site of battle between Alexander the Great and the Guptas. being the birthplace of Ashoka and his capital. lacked regional diversity and was more centralized. 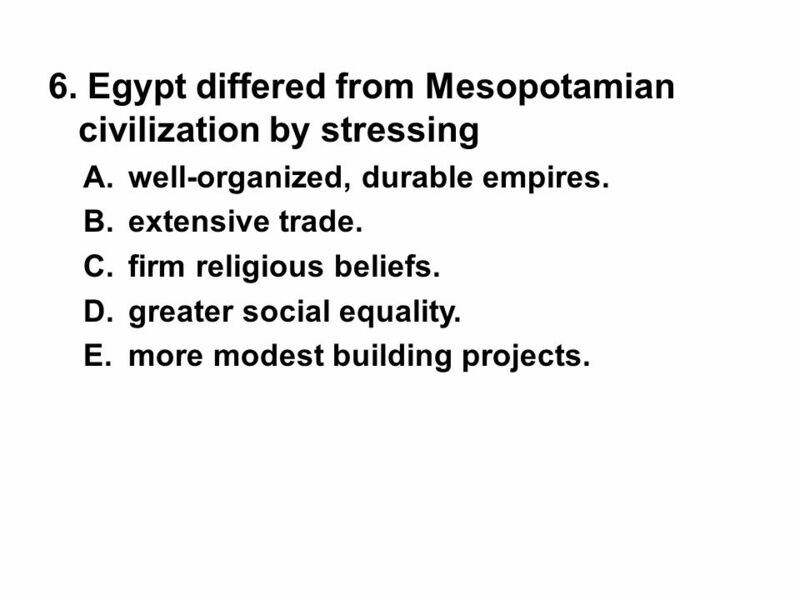 had greater contact with other societies and civilizations. 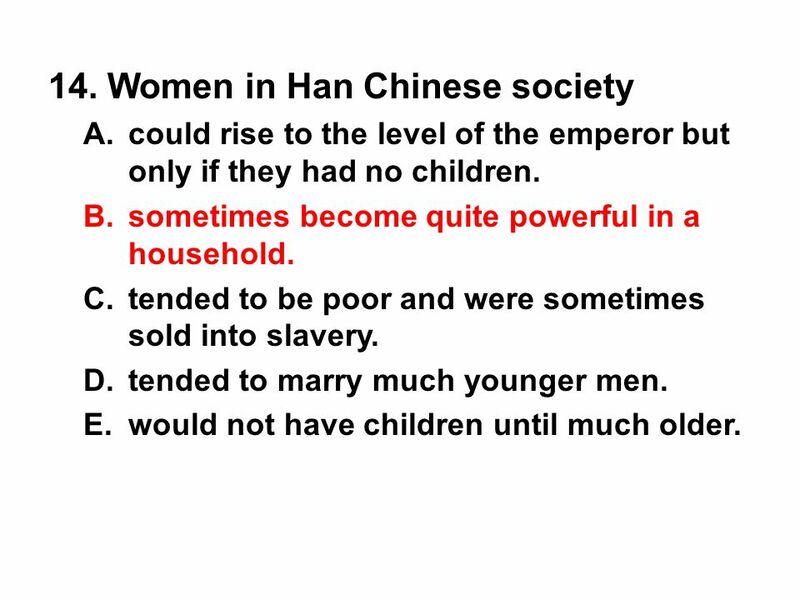 had a more flexible social structure that gave a greater role for women. was more secular in outlook with a focus on commercial values. had much more recent origins due to the invasion of the Aryans. showed considerable tolerance for different religions. attempted to conquer the most territory possible. developed a lasting tradition of strong, centralized government. welcomed influences from other cultures. created cultural traditions which rapidly died off. southeast Asia. the Middle East. China. Russia. central Asia. Athens and Sparta. Egypt and the Persian Empire. Macedonia and Crete. Sicily and Ionia. 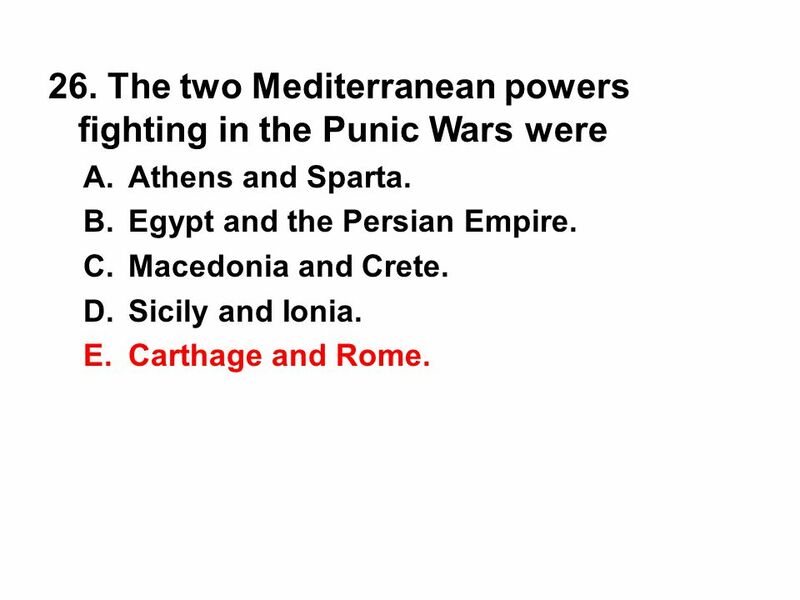 Carthage and Rome. urging that the state adopt policies to benefit ordinary citizens. separating foreign residents from citizens. naming experienced leaders as military generals. urging that all citizens participate directly in lawmaking and policymaking. electing representatives to govern the city-state. 57 28. 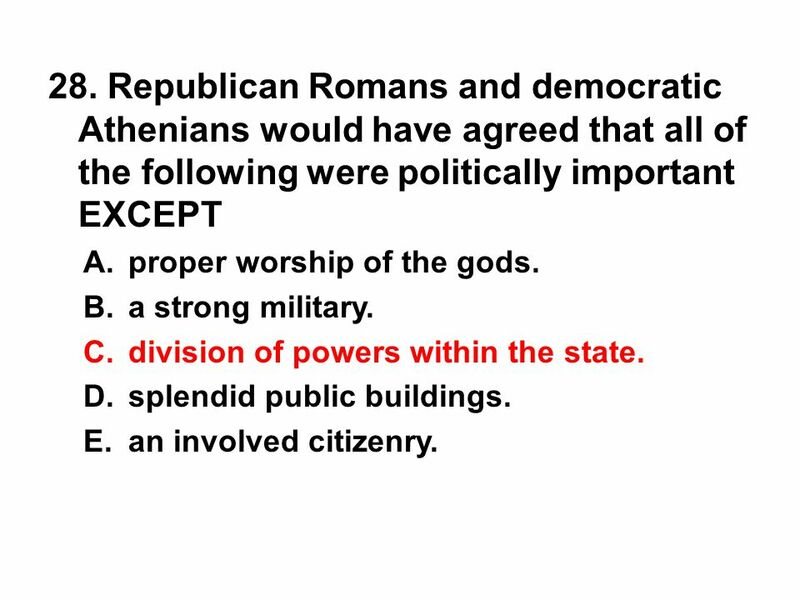 Republican Romans and democratic Athenians would have agreed that all of the following were politically important EXCEPT proper worship of the gods. a strong military. division of powers within the state. splendid public buildings. an involved citizenry. 58 28. 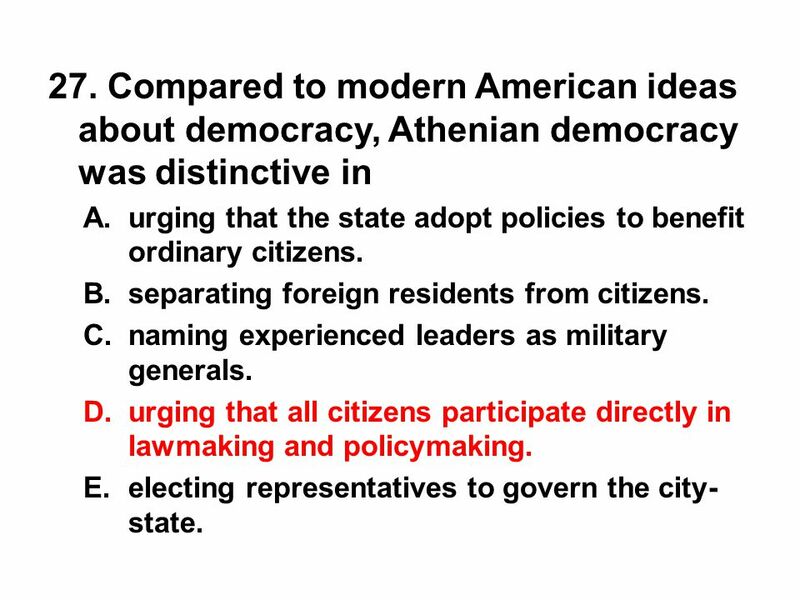 Republican Romans and democratic Athenians would have agreed that all of the following were politically important EXCEPT proper worship of the gods. a strong military. division of powers within the state. splendid public buildings. an involved citizenry. the landed aristocracy. the emperors. the urban workers. the merchants and businessmen. 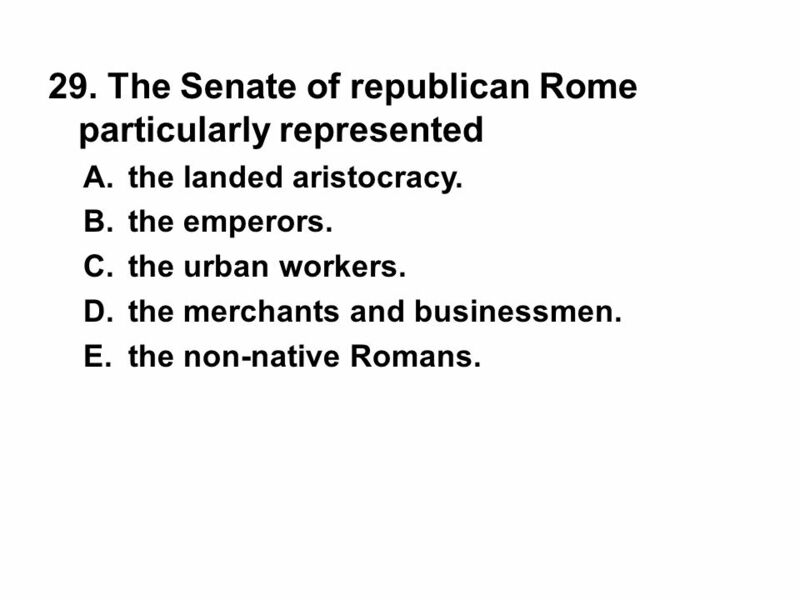 the non-native Romans. 61 30. The Roman Empire tolerated local political and religious diversity. insisted that all inhabitants become Roman citizens. prevented foreigners from trading within the empire. set up a military draft to supply the Roman legions. allowed no political participation from its citizens. 62 30. 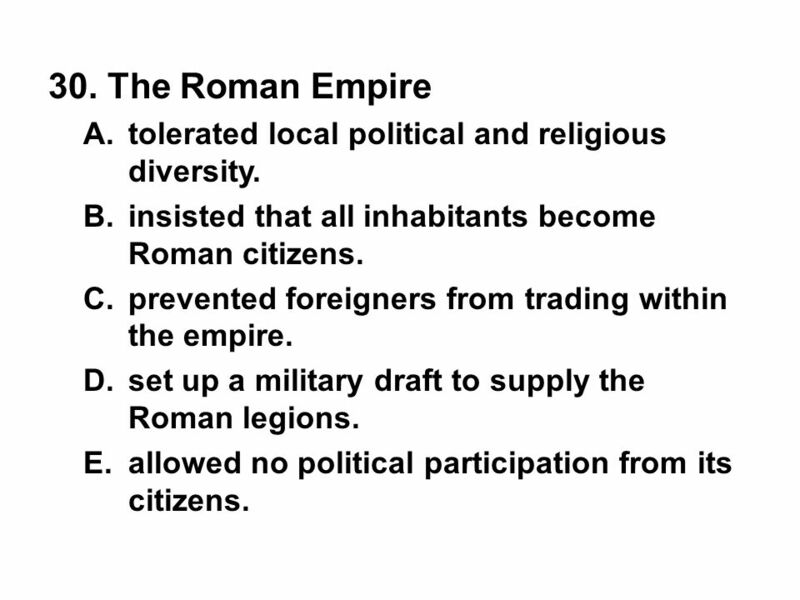 The Roman Empire tolerated local political and religious diversity. insisted that all inhabitants become Roman citizens. prevented foreigners from trading within the empire. set up a military draft to supply the Roman legions. allowed no political participation from its citizens. faith in authority. laboratory experiment. questioning. harmony. respect for elders. stressed the importance of practical applications. used mathematics to try and explain nature’s patterns. 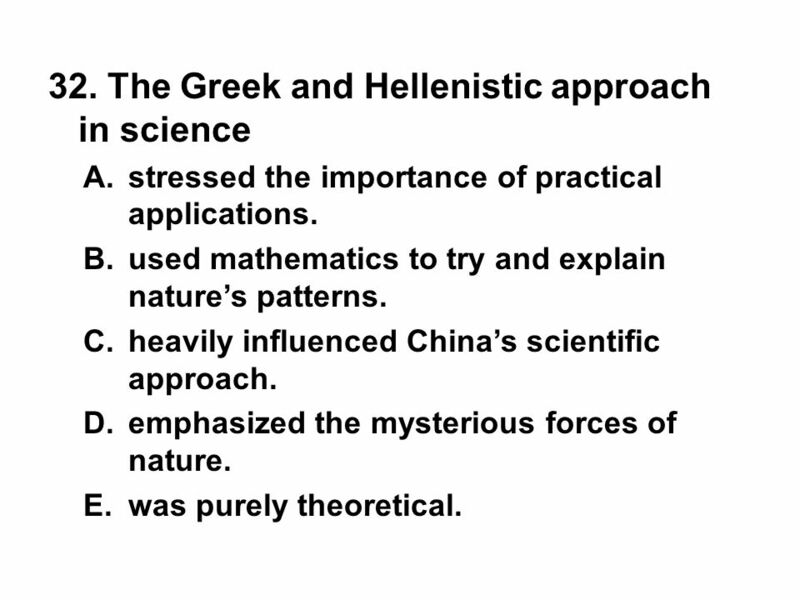 heavily influenced China’s scientific approach. emphasized the mysterious forces of nature. was purely theoretical. 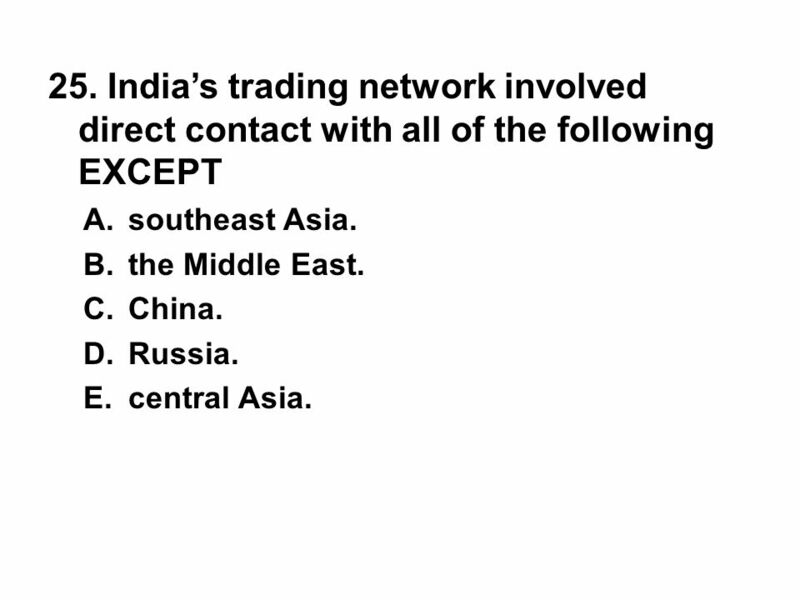 exported grain to Asia. concentrated on vegetables and dairy products. employed only a minority of the population. tended to develop large, commercial estates. ignored grape and olive cultivation. work in the mines. agricultural labor. household care and tutoring. military service. entertainment. medicine and geometry. Latin literature. democracy. religious thought. warfare. they had larger forces with more soldiers. they developed better supply lines. they believed they were fighting inferior cultures. they were more skilled as horsemen. they had smaller distances to cover. Central America. Brazil. the west coast of North America. Russia. the West Indies. a change in political institutions. 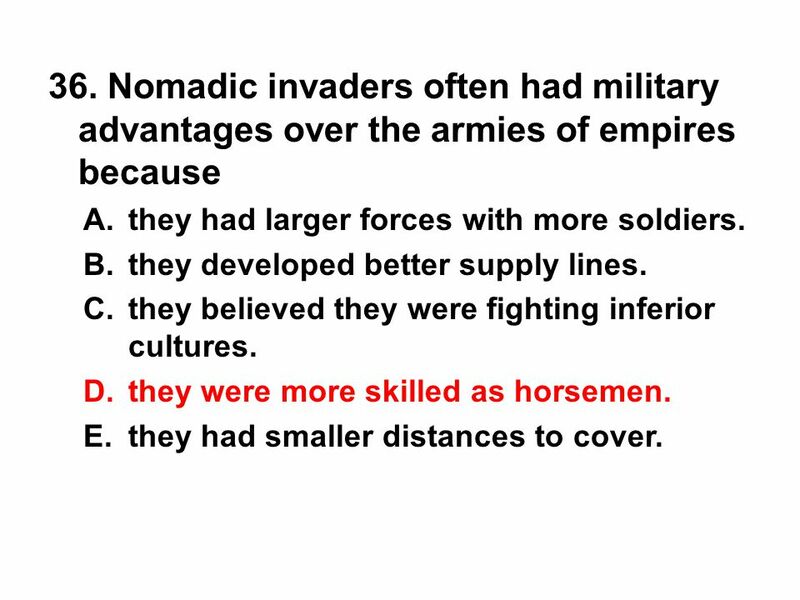 outside invasions such as the Huns and others. the introduction of a new religion for the majority. the weakening of central government. big cultural changes. the drop in population due to a series of plagues. the use of slave labor. the replacement of republic by empire. the weakness of the eastern portion of the empire compared to the west. acceptance of Christianity. 83 41. 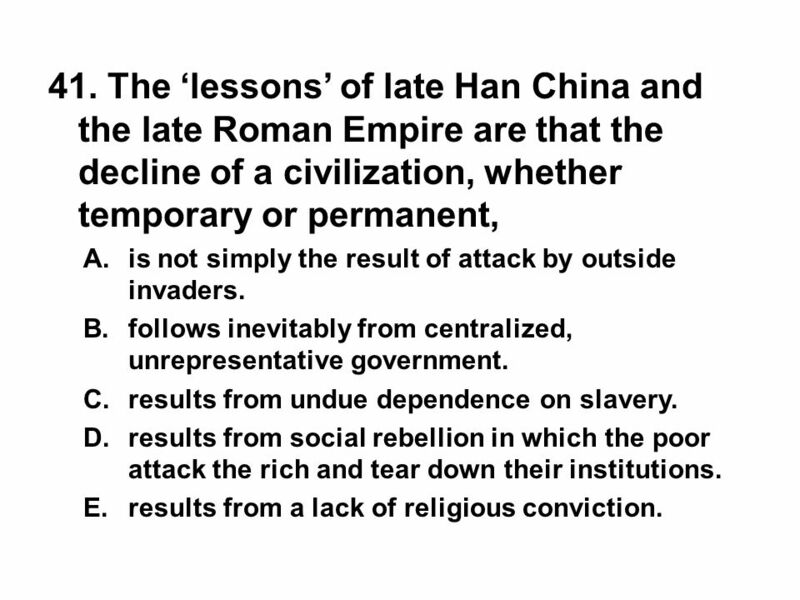 The ‘lessons’ of late Han China and the late Roman Empire are that the decline of a civilization, whether temporary or permanent, is not simply the result of attack by outside invaders. follows inevitably from centralized, unrepresentative government. results from undue dependence on slavery. results from social rebellion in which the poor attack the rich and tear down their institutions. results from a lack of religious conviction. 84 41. 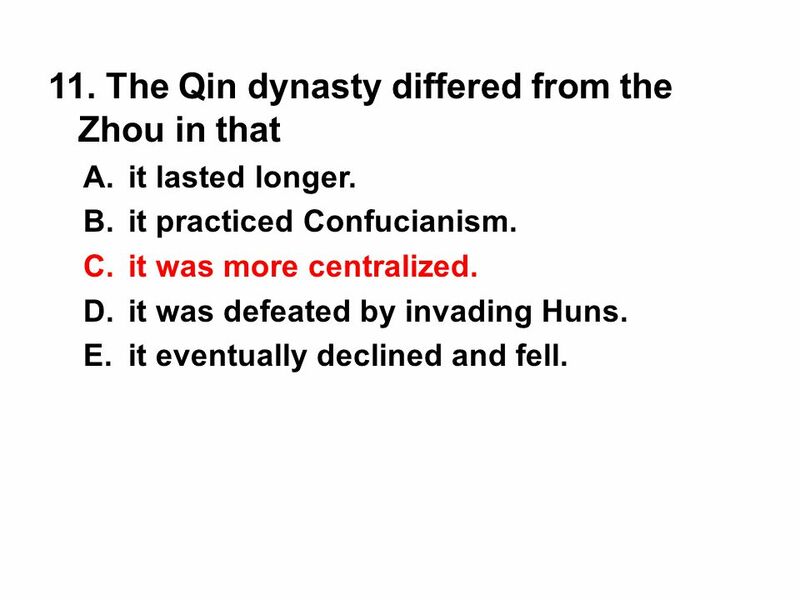 The ‘lessons’ of late Han China and the late Roman Empire are that the decline of a civilization, whether temporary or permanent, is not simply the result of attack by outside invaders. follows inevitably from centralized, unrepresentative government. results from undue dependence on slavery. results from social rebellion in which the poor attack the rich and tear down their institutions. results from a lack of religious conviction. 85 42. 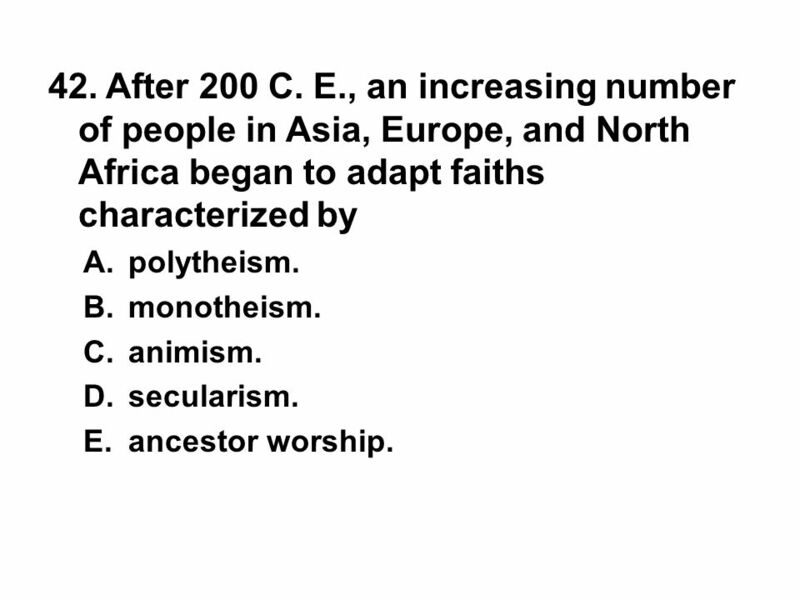 After 200 C. E., an increasing number of people in Asia, Europe, and North Africa began to adapt faiths characterized by polytheism. 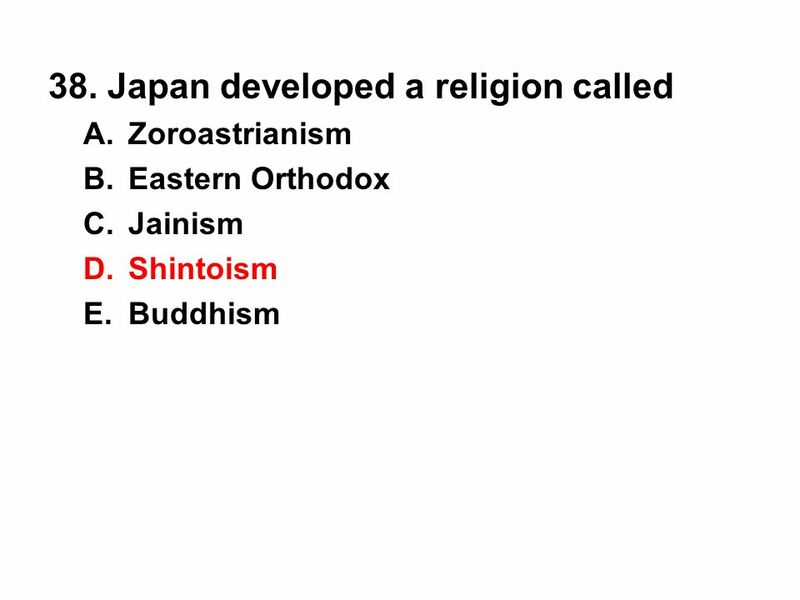 monotheism. animism. secularism. ancestor worship. 86 42. After 200 C. E., an increasing number of people in Asia, Europe, and North Africa began to adapt faiths characterized by polytheism. monotheism. animism. secularism. ancestor worship. strong priesthood. clearly organized church structures. absolute hostility to the worship of religious images and spirits of nature. life after death. polytheism. Dominic. Peter. Benedict. Francis. 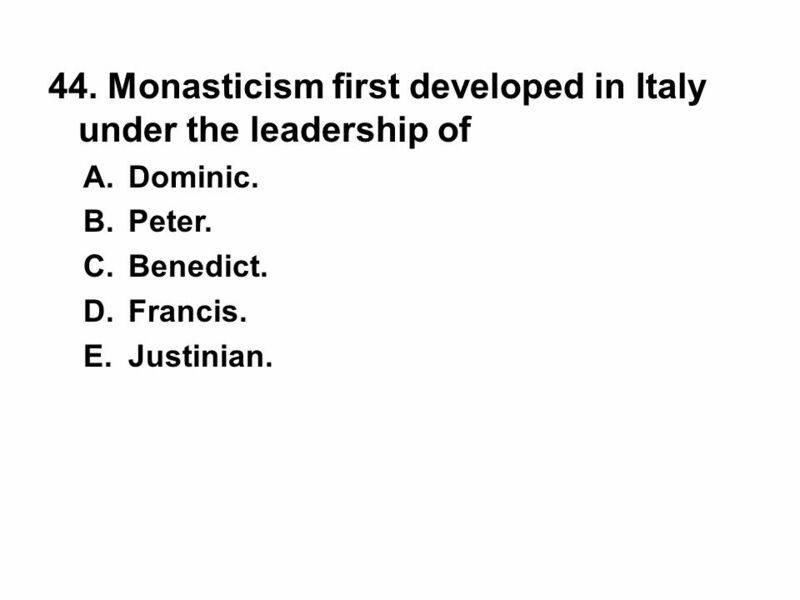 Justinian. someone who fights better than a peasant-soldier. someone who is not Christian. 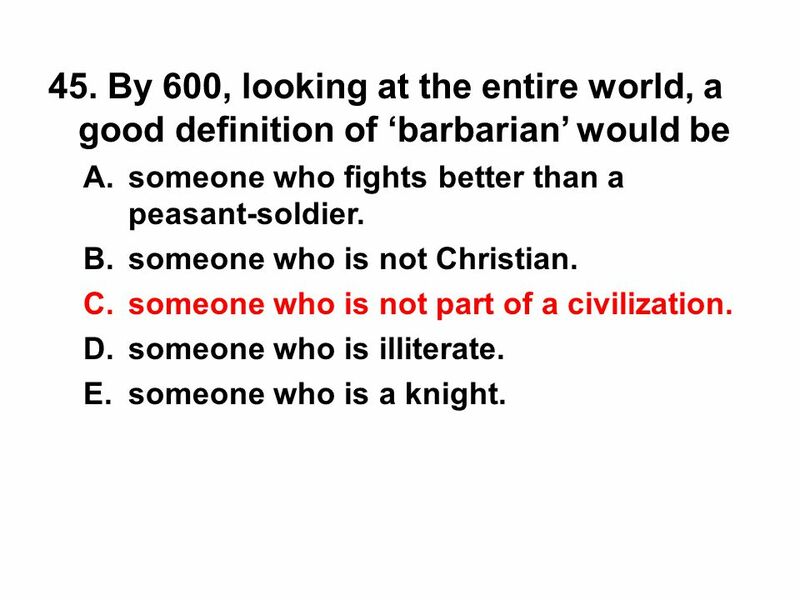 someone who is not part of a civilization. someone who is illiterate. someone who is a knight. 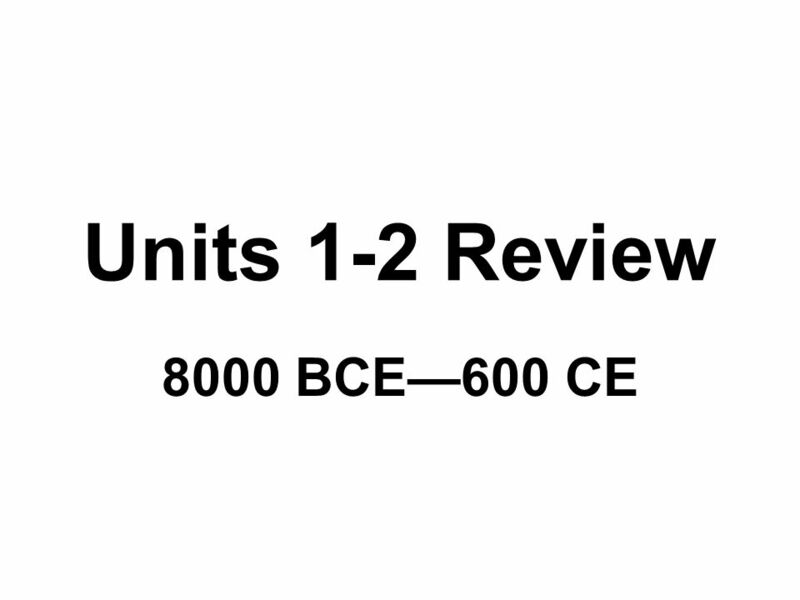 Download ppt "Units 1-2 Review 8000 BCE—600 CE." 1 10 pt 15 pt 20 pt 25 pt 5 pt 10 pt 15 pt 20 pt 25 pt 5 pt 10 pt 15 pt 20 pt 25 pt 5 pt 10 pt 15 pt 20 pt 25 pt 5 pt 10 pt 15 pt 20 pt 25 pt 5 pt Buddhism. Eastern/Western Civilization Study Guide December 16 th, 2013. 2 pt 3 pt 4 pt 5pt 1 pt 2 pt 3 pt 4 pt 5 pt 1 pt 2pt 3 pt 4pt 5 pt 1pt 2pt 3 pt 4 pt 5 pt 1 pt 2 pt 3 pt 4pt 5 pt 1pt River Valley’s China India and Religion. 1 10 pt 15 pt 20 pt 25 pt 5 pt 10 pt 15 pt 20 pt 25 pt 5 pt 10 pt 15 pt 20 pt 25 pt 5 pt 10 pt 15 pt 20 pt 25 pt 5 pt 10 pt 15 pt 20 pt 25 pt 5 pt Indus. 1 10 pt 15 pt 20 pt 25 pt 5 pt 10 pt 15 pt 20 pt 25 pt 5 pt 10 pt 15 pt 20 pt 25 pt 5 pt 10 pt 15 pt 20 pt 25 pt 5 pt 10 pt 15 pt 20 pt 25 pt 5 pt Prehistory. Jeopardy RELIGIONGREECELAW ODDS & ENDS Q $100 Q $200 Q $300 Q $400 Q $500 Q $100 Q $200 Q $300 Q $400 Q $500 Final Jeopardy ROME. 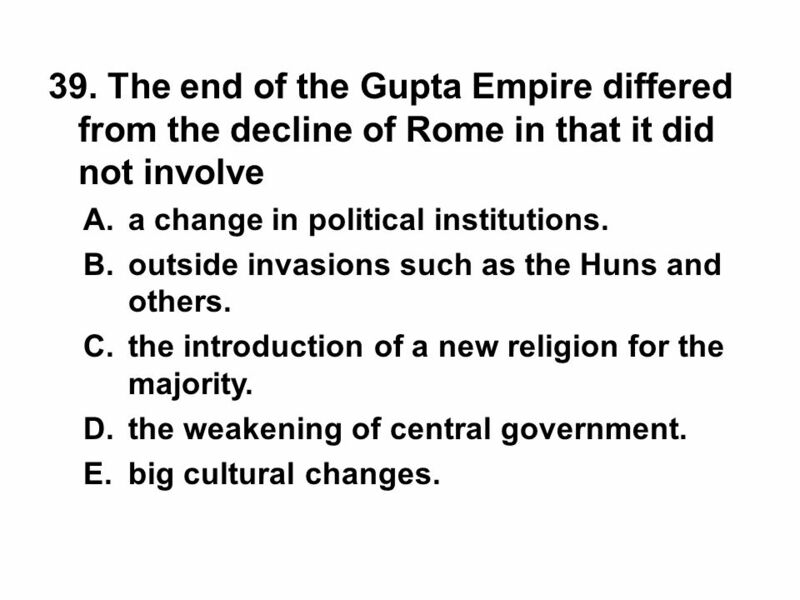 HAN, GUPTA AND ROME The Fall of Classical Empires. 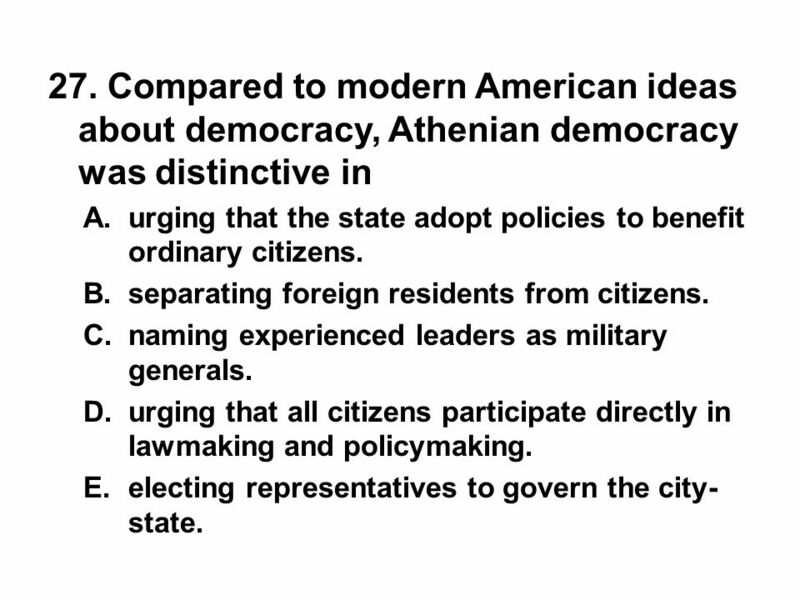 11/20 Focus 11/20 Focus: – Athens and Sparta were the two dominant city-states in Greece before the Peloponnesian War. – The war weakened both the military. Objectives Examine the indicators of civilization, including writing, labor specialization, cities, technology, trade, and political and cultural institutions. Chapter 1-4 Test Monday!!! Study. 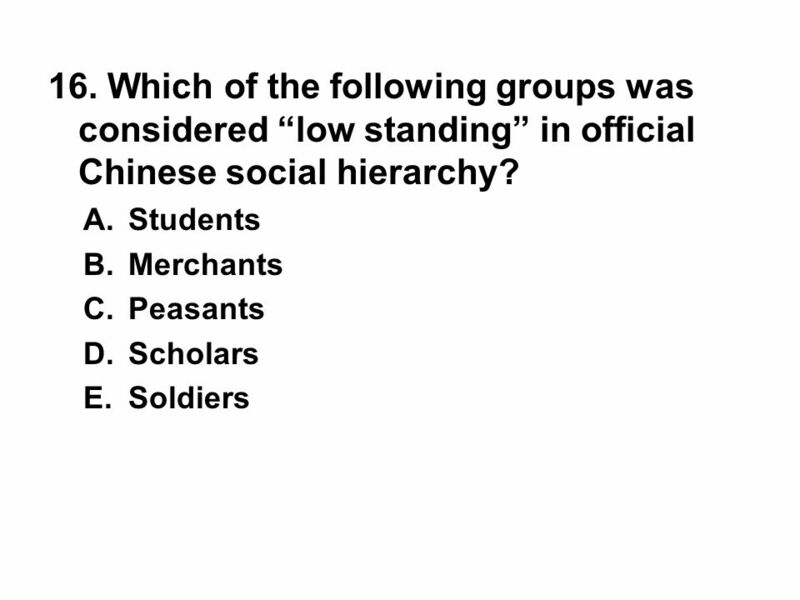 Study Guide: APWH Unit 1 Test 1. 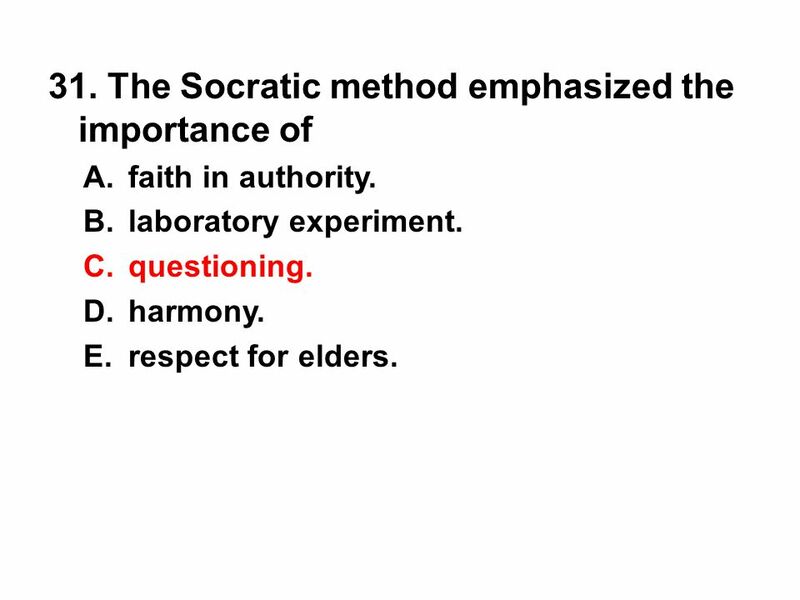 Know the key components of what makes a society. 2. Know what role writing plays in. How are “empires” different from “river valley civilizations”? 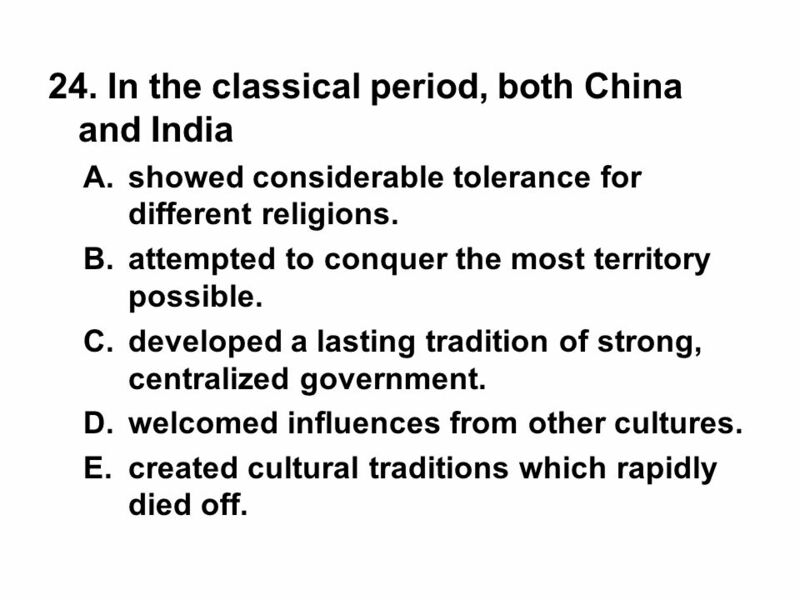 Classical Civilization INDIA! Topography of India Subcontinent of India is partially separated from the rest of the Asian continent by the Himalayas. 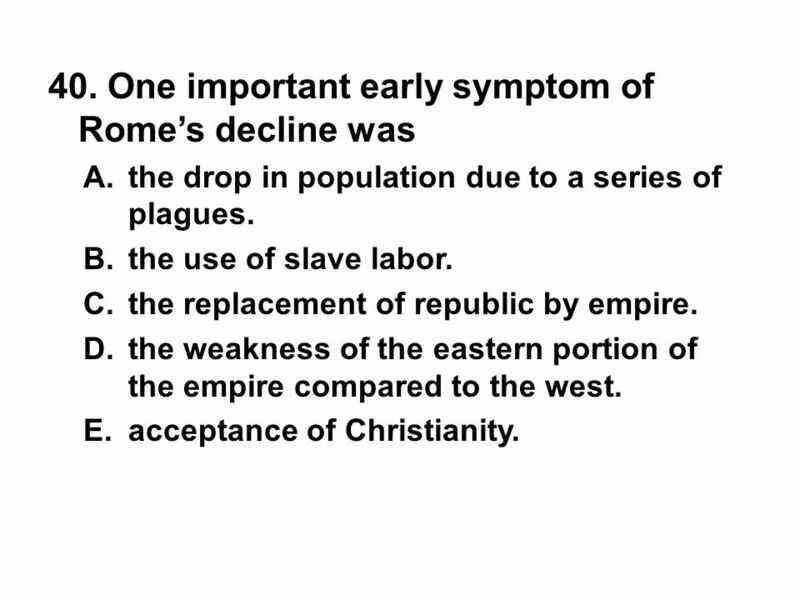 Early History of Europe. 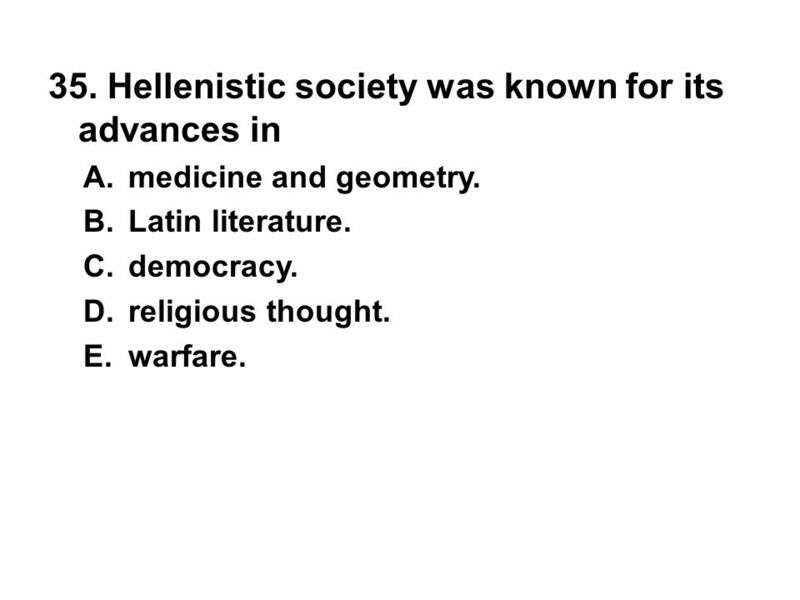 Classical Greece & Rome Both have made major contributions to the Western World even today. Classical Civilization Topography of India Subcontinent of India is partially separated from the rest of the Asian continent by the Himalayas.